With Indonesia notoriously in the lead for marine pollution, UK-based Plastic Energy’s agreement with the province of West Java (Indonesia) to build five chemical recycling plants comes as a relief. An MOU was signed recently by Plastics Energy and the Governor of West Java, Ridwan Kamil. It follows campaigns – including the United Nations (UN) Clean Seas, the Global Plastic Action Partnership, Our Ocean Conference – to reduce plastic pollution and, in particular, plastics reaching the ocean around Indonesia, a country which is second only to China for leaking plastic into the sea. In Indonesia, as well as the environmental advantages, the development of the five plants will also boost local economies providing both direct and indirect employment as well as establishing a blueprint for a range of waste management solutions, says Plastic Energy. The UK firm has two industrial plants which have been operational for more than three years in Spain and earlier this year reached an MOU agreement with chemical firm Sabic to provide feedstock for the production of certified circular polymers, following the establishment of a commercial plant in the Netherlands. In other news, Scandinavian tyre recycler Enviro's pyrolysis technology is now able to successfully extract carbon fibres from composite material, and it seems possible to utilise the material commercially within the automotive industry. This is demonstrated by the test results from a research project run by RISE (Research Institute of Sweden) in collaboration with Enviro. “The purpose of the research project is to evaluate how the recovered carbon fibres can be used in the automotive industry. The infrastructure sector and construction industry have already shown some interest as well,” adds Sörensson. The automotive industry's interest in materials that are simultaneously lightweight and strong is growing quickly. Carbon fibre components reduce the weight of vehicles without negatively affecting the strength of their materials. In addition to lightweight metal structures, carbon fibre materials are expected to be used more and more in vehicles in the future. 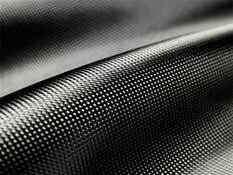 Around the world, the market for carbon fibre has consolidated into a few manufacturers, who are expected to grow by about 12% by 2024. The complexity of efficiently recycling carbon fibres, or combinations of carbon fibres and metal, has thus far limited our ability to produce commercial solutions for the automotive industry. At the same time there aren't many other options available, because one of the consequences of the legal requirements for reduced CO2 emissions from passenger vehicles in the EU (95 kg/km) is that vehicle weights need to decrease.